Sound & Vision opens new TV store in Leeds | What Hi-Fi? 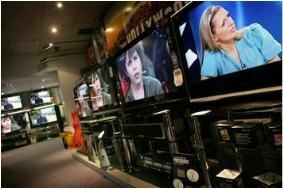 Located in Armley, the company says its new store is "an Aladdin's cave of technology, with the latest ranges of LCD and plasma TVs, home cinema and hi-fi equipment". It aims to match internet prices on many goods. Brands stocked include Sony, Panasonic, Toshiba, JVC, Philips, LG, KEF, Yamaha and Denon. The Leeds store is open seven days a week from 9am to 6pm, with late night opening on Thursdays until 8pm. Customers can browse online on the Sound & Vision website and pick up their goods in store, or or browse in the store and order online. Free delivery is offered to all mainland UK addresses.